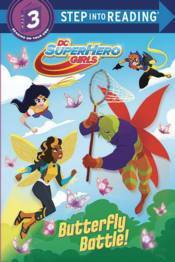 Get your cape on with the DC Super Hero Girls, the unprecedented new Super Hero universe especially for girls! Wonder Woman, Batgirl, and Bumblebee have to stop Killer Moth from bug-napping beautiful space butterflies that only visit Earth once every hundred years. Can the heroes net the villain before he flies off with these amazing creatures? Find out in this action-packed leveled reader! Step 3 Readers feature engaging characters in easy-to-follow plots about popular topic with text that is clear through context cues or illustrations.